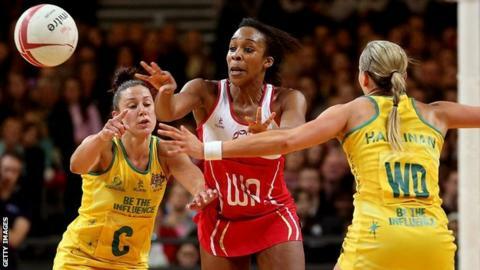 England captain Pamela Cookey says she is already focused on making her comeback from the injury that will keep her out of the Commonwealth Games. The 29-year-old ruptured her Achilles tendon playing for Team Bath on Saturday and could be out for up to seven months, meaning she will miss the Glasgow Games, which start in July. "I've got World Championships next summer and another Superleague season. "There's so much more to come," the goal attack told BBC Radio Bristol. "I've just got to make sure they are at the front of my mind and do all my rehab work. "Back when I was younger I injured my anterior cruciate ligament and I came back stronger from that, so hopefully the same will happen again." Bath-based Cookey will undergo surgery on the injury on Friday and it will be at least four months before she can return to training. She had already confirmed her absence from the England squad's trip to Australia next month because of work and training commitments, but was expected to lead the team for their Commonwealth campaign. "I've got to stay positive but I am gutted to miss the games, as it was a big thing that I've been planning towards," added Cookey. "I'll definitely be with the squad in spirit, watching them on the TV or up there with them if I can." England, ranked third in the world, are tipped for medal success at Glasgow after impressive victories in 2013 over Australia, Jamaica and South Africa.